But even then, I didn’t know about some other things you shouldn’t put in the microwave. Styrofoam, sure. I am wary of plastic. But now our good friends at Consumer Reports suggest a few other non-microwave-friendly items. For example, CR says to stay away from even non-metal sharp objects. 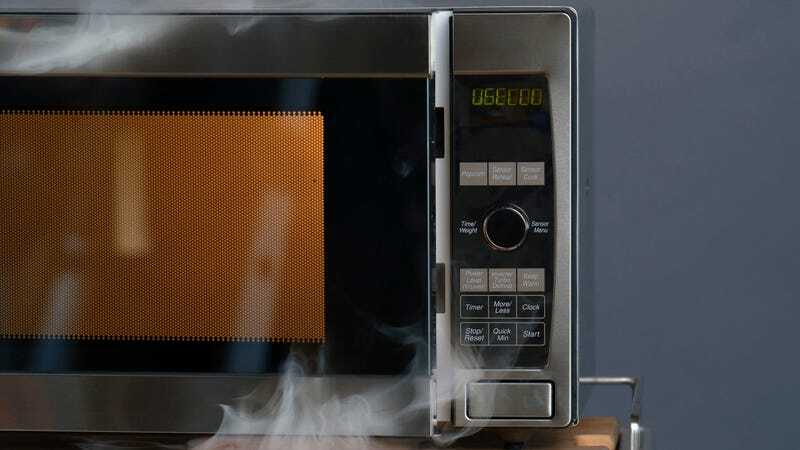 According to Tim Jorgensen, associate professor of radiation medicine at Georgetown University, “Anything that comes to a point can cause a spark and fire” in the microwave due to a condition known as “arcing.” Even a toothpick. A toothpick! Also, you may be trying to be a good kitchen citizen by microwaving your sponges, but unfortunately you may be doing more harm than good. Markus Egert, professor of medical and life sciences at the Institute Of Precision Medicine, Microbiology, And Hygiene Group at Furtwangen University in Germany, offers this straight-up terrifying fact: “The remaining [bacteria] grow up again and become resistant with time—and these resistant bacteria might be more harmful to humans.” So really, by microwaving your sponges, you’re just making bacteria stronger, playing into their tiny little hands. This last one is weird because I didn’t realize this was a thing people actually did, and I’m someone who still has to look up “how to hard-boil an egg” every goddamn time. But CR says to stay away from putting whole, raw eggs in the microwave: Sometimes it may result in a microwave-boiled egg, and sometimes the egg may explode, resulting in a gross and potentially very smelly mess. Find out more at Consumer Reports today. I’m just glad that CR didn’t say not to put Peeps in the microwave, because I’m absolutely doing that next week for Easter.